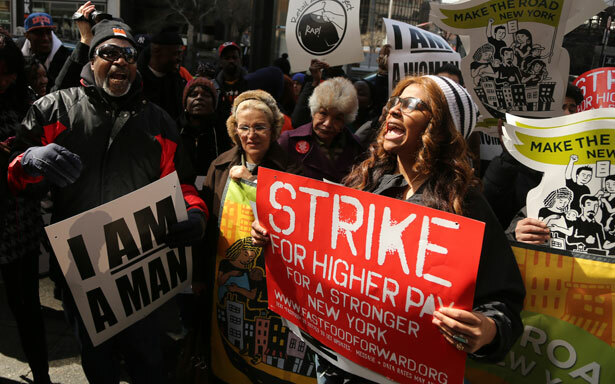 Fast food workers across America aren’t waiting on Congress to raise their pay. This week, they’re taking matters into their own hands by organizing a nationwide strike aimed at securing better pay for their families and basic rights in the workplace. I had a front-row seat when workers across the country participated in a national telephone call to approve the strike. I could barely contain my excitement as, one-by-one, workers from cities across our county enthusiastically endorsed the strike: “Atlanta? Yes!” “Pittsburgh? Yes!” “Wausau, Wisconsin?” “Yes, because we can’t survive on $7.25!” Their request is a simple one: $15 an hour and the right to organize a union. And just like that, some of the hardest-working and lowest-paid Americans declared they aren’t taking it anymore. Today, they will take to the streets. Although they come from different communities and cultural backgrounds, they’re joining together today to fight for a fair wage and a voice on the job. They know the stock market is at a record high and the purchasing power of the minimum wage is at a forty-year low. They know out-of-touch Republicans in Congress—philosophically opposed to programs that give working people a leg up—aren’t going to help. They don’t want to rely on assistance from the government or charity, but because they are paid so little, they have no choice. Workers are leading movements for better pay and higher working standards all over the country. Federal contract workers successfully organized last year to get President Obama to sign an executive order raising their pay. In Minnesota, Centro de Trabajadores Unidos en Lucha organized workers who clean big-box retail stores and, this winter, they brought Target to the table for negotiations on workers’ rights. Saru Jayaraman and the Restaurant Opportunities Center are working to raise the tipped minimum wage from an abysmal $2.13 an hour. Today’s activists owe a lot to Occupy Wall Street, which focused the nation on growing inequality. Now Americans are rising up all over the country. In North Carolina, Reverend William Barber is leading the Moral Mondays movement. This movement is Southern, grassroots and inclusive. Historically, it’s been difficult to create multiracial movements in the South, but the Moral Mondays community has turned conventional wisdom on its head. Elsewhere, domestic workers are organizing against corporate power in Washington and adjunct professors are fighting for more rights in the classroom. We are in the midst of a grassroots populist movement designed to rebalance the tilted economic scales that have favored the wealthy and powerful in our country for too long. The movements aren’t all saying the same thing, but their chants rhyme: put working families first. In Washington, the agenda of corporations too often trumps the agenda of America’s middle class. Corporate leaders call and politicians answer. But when the working class calls to tell its representatives about the jobs that have disappeared because of bad trade deals or the paychecks that are smaller than they were twenty years ago, no one answers. Workers have stopped calling. They know the only way politicians see the light is if they feel the heat. Today, thousands of fast-food workers will be out in the street demanding a higher wage, dignity and the opportunity for a better life. They’re doing it because they have families to feed, parents to look after and basic needs that can’t be met at $7.25 an hour. According to the National Employment Law Project, the average age of fast-food workers is 29. Forty percent are 25 or older; 31 percent have at least attempted college; more than 26 percent are parents raising children. These are Americans with a lot on the line, who won’t be easily deterred. The late Senator Paul Wellstone of Minnesota used to say, “If politics is the art of the possible, then organizing is the art of making more possible.” Workers around the country see the lack of possibilities in Congress on the minimum wage, unemployment insurance and immigration reform. They’re choosing to organize.